Finding the best immigration lawyer in Fort Worth seems like a big task – but you can use these tips to narrow your search and zero in on the right attorney for your needs. First things first: you need to make sure you’re dealing with an attorney, not someone billing him- or herself as a visa consultant, petition preparer or notario. These people are not attorneys and can’t give you legal advice. Worse, they may not even know what they’re doing. When you are dealing with an immigration attorney in Fort Worth, he or she can only tell you the truth – and no attorney can ever guarantee you a certain outcome. 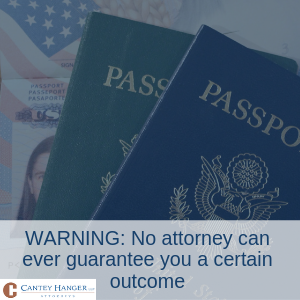 Your case’s fate is in USCIS’s, Homeland Security’s, or an immigration judge’s hands… not your lawyer’s. Pro tip: Always watch out for lawyers who tell you to lie on an application or in an interview, or who ask you for money to bribe officials. If you encounter an attorney like this, run. Doing these things can get you into heaps of trouble, and you may even be barred from entering the United States in the future as a result. United States law can be complicated (have you seen the Immigration and Nationality Act? ), so for most people, it makes sense to work with an experienced Fort Worth immigration attorney. That’s not to say that working with a new lawyer is bad – it’s only to say that lawyers who have filled out hundreds of immigration forms know what to look for, how to help prepare their clients for interviews, and understands what kinds of issues can trip up an application and drag out the process. Do You Need to Talk to an Immigration Lawyer in Fort Worth? If you’re considering immigrating to the U.S. or you want to sponsor foreign workers, we may be able to help you. Call 817-529-4509 to schedule a consultation with an experienced, knowledgeable attorney today. Charlie underscores that we should expect EB-1 to move at the lower end of the projected range of 0-2 months for EB-1 Worldwide and 0-1 months for EB-1 China and EB-1 India. Based on the continuing high demand, we should expect “minimal if any’ movement in the EB-1 categories, and especially in EB-1 China and EB-1 India. The Final Action Date for EB-2 China remains ahead of EB-3 China, and continues to advance at a faster rate, with EB-2 China advancing three months to January 1, 2016 in March, and EB-3 China advancing only one week to July 8, 2015 for March. Given the projected advancements and barring any changes in the demand trends, members can expect this to continue for the foreseeable future. Demand in this category continues to remain below the targeted level, requiring the Final Action Date for EB-3 Philippines to advance 4 months to December 1, 2017, in an attempt to generate demand. The Final Action Date for EB-4 El Salvador, Guatemala and Honduras holds at March 1, 2016 in March, and EB-4 Mexico advances 4 months to January 1, 2018. EB-5 China advanced the Final Action Date by one week to September 8, 2014 for March. The Final Action Date had previously been advanced in January in anticipation of the Chinese New Year but processing was limited due to the sunsetting of the EB-5 I5 and R5 programs until very late in the month. Guangzhou is working to process as many cases as it can in February, but these may spill into March. EB-5 Vietnam has less demand with early priority dates and as such reaches a Final Action Date of July 15, 2016. The rule was sent to the Office of Management and Budget (OMB) on February 20, 2019, and is currently pending review. Once OMB completes its review, a notice of proposed rulemaking will be published in the Federal Register and will be open to the public for notice and comment. The proposed regulation will not take effect until finalized by DHS, a process that typically takes several months. Please note that the text of the proposed rule has not yet been made available to the public. Members may wonder why EB-2 Worldwide would remain current “for the foreseeable future” while EB-3 Worldwide would simply be “current.” According to Charlie, both categories will remain current through May 2019 and are likely to remain current throughout this fiscal year. As a Final Action Date was imposed for EB-2 Worldwide during the last fiscal year, Charlie wanted to underscore the fact that based on current demand trends, he does not anticipate a Final Action Date will be imposed for EB-2 Worldwide during FY19. However, if USCIS demand significantly increases in the coming months, there is always the possibility that a Final Action Date will be imposed, in EB-2 Worldwide, or any other category. USCIS determined that for January 2019, the Dates for Filing chart must be used for both family-based preference filings and for employment-based preference filings.